Scoliosis is a lateral curving of the spine with the thoracic area being the most commonly affected. It can be classified as functional or structural. Functional scoliosis is the result of another deformity and is corrected by treating the underlying problem. Structural scoliosis is most often idiopathic although it may be congenital or secondary to another disorder. There is a growing body of evidence that idiopathic scoliosis is probably genetic but the etiology is not completely understood. Structural scoliosis is more progressive and causes changes in supporting structures, such as the ribs. Management includes observation, bracing, and surgical fusion. Patients with idiopathic curves of less than 25 degrees are observed for progress until they have reached skeletal maturity. Bracing is recommended for adolescents with curves between 30 and 45 degrees, while curves greater than 45 degrees usually require surgery. The deformity may occur at any age, from infancy through adolescence, but the best prognosis belongs to those who are almost fully grown and whose curvature is of a mild degree. Idiopathic scoliosis most commonly occurs in adolescent girls. 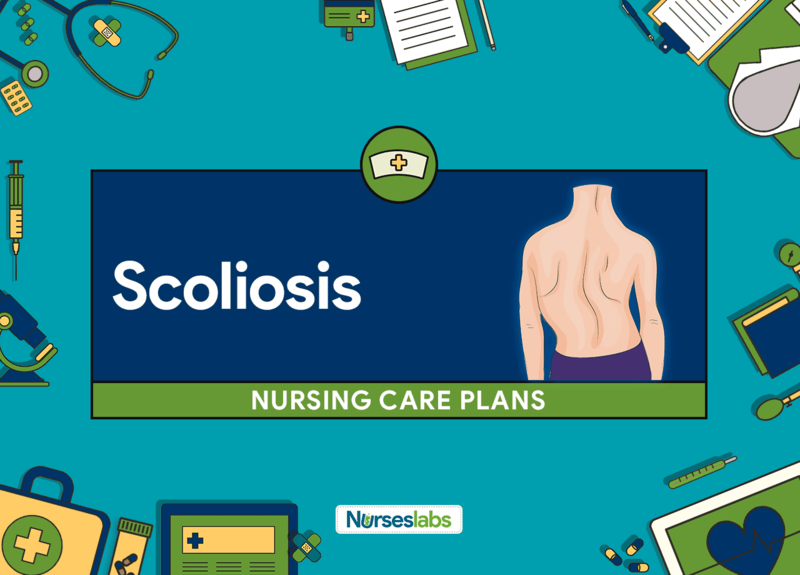 Nursing care planning goals for a pediatric client with scoliosis may include restoration of normal breathing pattern, relief of pain, improved physical mobility, enhanced learning, stop the progression of the curve and prevent deformity. Client will maintain an effective breathing pattern, as evidenced by relaxed breathing at normal rate and depth and absence of shortness of breath. Assess respiratory status every 4 hours. Scoliosis hinders the movement of the ribs, therefore weakens the respiratory muscles causing an increase in the work of breathing during, rest, activity or at sleep. Auscultate breath sounds at least every 4 hours. This is to detect decreased or adventitious breath sounds. Monitor intake and output. Adequate hydration mobilizes secretions and prevents infection. Assess oxygen saturation and pulse rate by using pulse oximetry. Pulse oximetry is a helpful tool to detect alterations in oxygenation. Assist the child in doing deep breathing exercises. Deep breathing exercises are initiated to improve lung function. Place the client in a semi-Fowler position. Facilitates expansion of the lungs. Frequently reposition the child every 2 hours. Promotes lung field inflation. Assist the child in using an incentive spirometry. Improves lung expansion and aeration of the alveoli.